The initial focus of the Marcus Center for Therapeutic Cell Characterization and Manufacturing (MC3M) are in the areas of (a) mesenchymal stromal/stem cells (MSCs) from bone marrow and cord tissue for immune-modulation and tissue-biofabrication, (b) T and B cells for immunotherapies in cancer, infectious and autoimmune diseases; and (c) Cord blood and bone marrow hematopoietic stem cells for regenerative medicine. The Center will implement the National Roadmap for Cell Manufacturing, recently published by the National Cell Manufacturing Consortium (www.cellmanufacturingusa.org) and highlighted by the White House. View the fact sheet. MC3M is the first such research center in the United States. 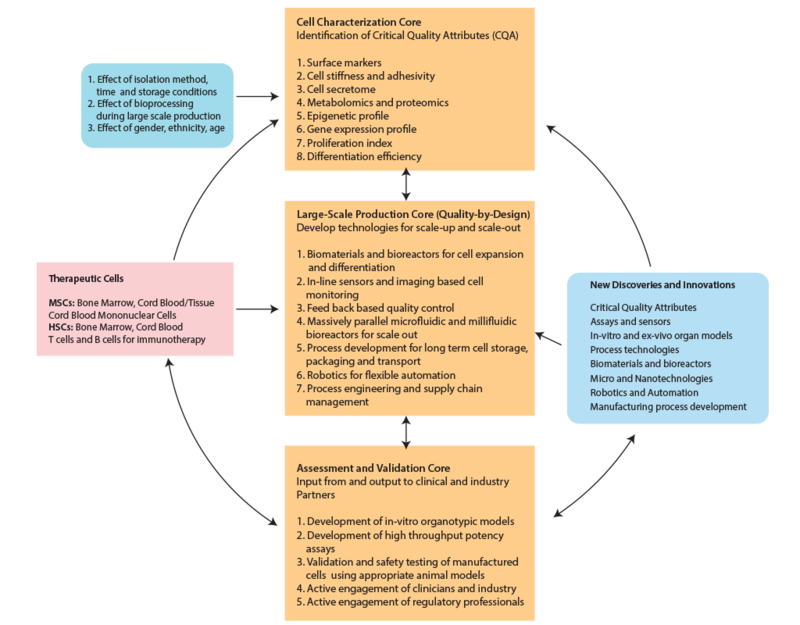 The current state-of-the-art in cell therapies involves small scale, hospital-centric processing of cells, operated with minimal characterization, and little involvement of process engineering and QA/QC concepts leading to wide variability and uncertainty in clinical trials. In addition to developing new tools and technologies, standards development will be a long term goal of MC3M. The Center will seek appropriate federal, industry and standards-organization partners. Standardization and reproducibility are inter-related fundamental challenges in this field, as in all areas of biomedical research. We believe that through cell characterization throughout the manufacturing process flow, combined with a steadfast focus on potency, efficacy, and toxicity, as well as rapid dissemination across stakeholders, will aid us in vastly improving reproducibility and establishing standards and best practices across the cell therapy spectrum.